(American) Debussy: Three Nocturnes (with female choir), Chickering Concert, February 10, 1904-Mr. Georges Longy conducted (Herald ad, (January 30, 1904): 10). Was the second piece on the program and then repeated for the final piece. (Boston) Franck: Les Djinns for Piano and Orchestra, Chickering Concert, February 24, 1904-Lang conducted. Soloist-Mrs. Jessie Downey Eaton. (Boston/American) Glazunov: Symphonic Poem, Opus 13, “Stenka Razin.” Chickering Concerts, March 23, 1904. (Boston) Paine: Prelude to the Birds of Aristophanies (Paine conducted, March 9, 1904, Chickering Concerts. (American) Perilhou: Andante in G Major for Violin, Harp and Organ. March 24, 1904 Benefit Concert arranged by Lang for the Berkeley Temple (Congregational) Church. Herald, March 20, 1904, 33. CECILIA PREMIERS: dates from the 1907 List, except where noted. (Boston) Bruckner: Te Deum. December 12, 1905. (American) Charpentier: The Poet’s Life. April 4, 1905. (Boston) Coleridge-Taylor: Death of Minnehaha. February 3, 1903. (Boston) Debussy: The Blessed Damozel. April 4, 1905. (Boston) Elgar: Dream of Gerontius. January 26, 1904. (American) Foote: A Motet: Vita Nostra Plena Bellis (Mortal Life is Full of battle), Op. 47. February 4, 1902. (Boston) Franck: Psalm 150. February 4, 1902. (Boston) Henschel: Stabat Mater. March 31, 1901. (World) Henschel: Requiem. On December 2, 1902. Henschel conducted. (World) Hutcheson: Piano Concerto. March 9, 1904. Lang conducted. (American) d’Indy: St. Mary Magdalene. February 6, 1906. (Boston) Loeffler: L’Archet. February 4, 1902. Loeffler played. (American) Massenet: The Promised Land. April 8, 1902. (Boston) Mozart: Te Deum. December 11, 1906. (World) Paine: Azara. April 9, 1907. First complete-in concert form. (Boston) Pierne: The Children’s Crusade. February 26, 1907. (Boston) Strauss: Taillefer. April 3, 1906. Elson, The History of American Music, 1904, 258. CECILIA SINGS BRAHMS GERMAN REQUIEM AT MEMORIAL SERVICE FOR GOV. ROGER WOLCOTT. Contemporary music continued to interest Lang even late in his career. Beginning in December of 1901 and continuing through early 1903, performances of the Richard Strauss melodrama Enoch Arden (words by Tennyson) were read by George Riddle with the music played by Lang. Frances recorded: “Lel is rehearsing with George Riddle for a performance of Strauss’s Enoch Arden. This evening played the music to us. It is quite beautiful.” (Diary 2, Fall 1901) A note from the program said: “The musical setting is by Richard Strauss, who is today attracting the attention that Richard Wagner did forty years ago.” The first performance was probably in Salem on December 4, 1901 followed by a second at Boston’s St. Botolph Club on December 15. It was then presented for the Harvard Musical Association on December 27, and that was followed by three performances in March in Dedham, Wellesley College, and Jamaica Plain. A regional tour followed in April with four performances in New Haven, Providence, New York City, and Philadelphia with a Chickering Hall, Boston performance in the middle of this tour. The Globe wrote of this Boston performance: “Mr. George Riddle gave a most effective reading last night…of Enoch Arden.” (Globe (February 20, 1902): 2) Of Lang’s part: the “subtleties were well brought out.” (Ibid) Another Boston performance was given at Chickering Hall on April 21, 1902 and this was noticed in the Society Page of the Herald. The audience was “cultivated and appreciative” while “Mr. Riddle’s talent has never been so conspicuously and brilliantly shown…Mr. Lang’s part, it goes without saying, was beautifully done.” Among those attending were Lang’s friends Mr. and Mrs. R. C. Dixey and Rosamond Dixey and nineteen others who were named. (Herald (April 27, 1902): 31, GB) A final performance eight months later was presented in Washington, D. C. on January 19, 1903. Just making the concert and travel arrangements for this project must have been a major undertaking! MISS ROBBINS AND MISS MAUDE ADAMS, THE ACTRESS. 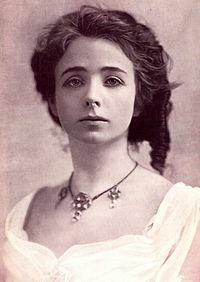 Maude Adams (1872-1953) 1892 Photo when she was aged 20. The incident mentioned above probably happened about ten plus years later. Wikipedia (Accessed November 1, 2013). Frances recorded in her evaluation of the fall 1901 concert: “Cecilia Concert. A great performance of the Bach B minor Mass. A huge was wreath presented to Lel. Newspapers full of praise the next day.” (Diary 2, Fall 1901) The headline of the Globe review of February 5, 1902 was “Four Boston Composers-Their Works Beautifully Given at the Cecilia Concert.” The review began by saying that “None of the many excellent Cecilia programs of recent seasons has proved better worth a thoughtful hearing, and few have been more enjoyable than the Cecilia concert last night in symphony Hall.” Pieces from Arthur Foote, Charles Loeffler, John Paine, and Margaret were performed. “His daughter’s song Love Plumes His Wings with its singularly soaring soprano score, was beautifully rendered by female voices; and it is high praise to say that the Cecilia singers have never given a female chorus as well unless it be in The Lord is my Shepherd, of familiar memory…It is a pity that there were some vacant seats at a concert so varied and so worthy of a greater audience. 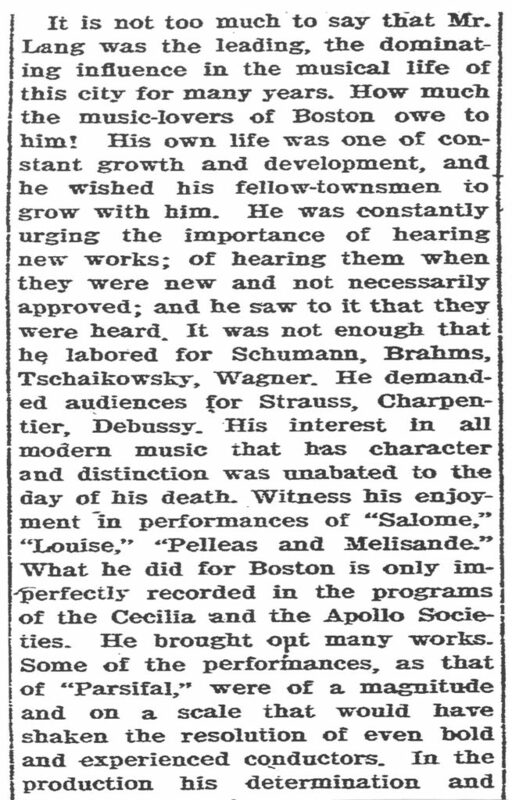 There was a good representation of Boston’s musical colony present, and the second concert of the Cecilia’s 26th season will go down in the annals as a notable one.” (Globe (February 5, 1902): 3) Lang’s interest in Paine’s opera Azara was reflected in his programming of an aria from this work. A complete concert performance would be Lang’s last concert with Cecilia. The Foote piece in the concert, called “a Motet,” was Vita Nostra Plena Bellis (Mortal life is full of battle), Op. 47 for four or eight-part chorus with a text by Alanus de Insulis [Insulanus] translated by John Lord Hayes from “Corona Hymnorum Sacrorum” (Cipolla, Foote Catalog, 45). This piece was reprinted as part of Walton Music”s “Library of Congress Series” where it is described as “A choral tour de force with a text by Alain de Lille (ca. 1128-1212).” (www.waltonmusic.com/congress.html) The Globe review noted: “Mr. Foote conducted his own exceedingly forceful and inspiring, but unaccompanied ”Motet” based upon a resonant old Latin hymn, and composed by the President of the Cecilia with his own club’s special powers of interpretation in mind.” (Globe, Op. cit.) Two years later, in 1904, Foote acknowledged his debt to Lang through the dedication of his Suite in D major, Op. 54 to B. J. (Cipolla, Op. cit., 68) An earlier dedication to Lang had been the Quartett in G Major, Op. 4 where the manuscript is dated “6 Aug 84.” (Cipolla, Op. cit., 72) “The Loeffler piece was L’Archet which had had a private premier the previous winter in Mrs. Sears’s music room under Lang’s direction using voices from the Cecilia. For this performance the work was sung in French by a 40-ladies voices, and there are to be special lessons in diction from the same charming Parisienne who gave the finishing touches last winter.” (Herald (January 12, 1902): 29, GB) Leave it to Lang to make sure that these details were seen to. The Promised Land by Massenet was sung on April 8, 1902. The world premier had been just two years earlier in Paris at the church of Saint-Eustache on March 15, 1900. The Society page of the Herald wrote: It “is to be regarded as Massenet’s tribute to this country [USA], now when everyone over there is intent on doing us honor. He said: ”Now I must write something for America,” and the Promised Land was the result. It suggests what the composer’s idea of us is – full of brilliancy, dash and vigor, beautiful and joyous after the victory. The Cecilia will make it a red letter night and everybody will be there.” (Herald (March 23, 1902): 31, GB) In the Music Section of the Herald on the same day, the paper did its best to create excitement: “The Cecilia means to make the production of this particular work the most memorable in its annals.” Certain parts were mentioned: “The fall of Jericho is an example of the intensity of the orchestral and choral effects. The March round the walls is an overwhelming piece of orchestration, the seven trumpets standing out against the rest with thrilling insistence.” (Op. cit., 36, GB) Two days before the event, the Herald again gave extensive coverage to the upcoming concert and made the suggestion the those who would be attending should read those sections of the Bible that Massenet had chosen: “It will not hurt anybody to have a little broader acquaintance with the story.” (Herald (April 6, 1902): 35, GB) However, after hearing the piece, the Herald quite lengthy review was mainly negative. It praised the choir for its preparation and wished that the soloists had done the. The soloists diction was very poor and they were obviously unprepared to sing in French which “made some grotesque and dreadful blunders in the text, and their phrasing.” (Herald (April 9, 1902): 9, GB) The suggestion was made that the work should be heard in church, for which the piece had been written, rather than in a concert hall. Hale, in the Journal headlined his review: “A Work Without Dignity and With Little Beauty.” He quoted from the Program Book often: first that “Massenet himself has it his favorite work.” Hale’s comment was: “Massenet has this amiable weakness for all his compositions, whether it be one of his pornographic operas, or his latest work.” Massenet had required the Cecilia to agree to certain conditions before he would allow the work to be performed in America. One was that it must be sung in French, and the choir thus included coaching in the language as part of their rehearsal schedule. The result was that any choir member “would have no difficulty in obtaining a good bargin…at any respectable shop in Montreal or Quebec.” Overall Hale found the work “as a whole, without solidity, dignity, or abiding beauty. The music is often boresome; and when ie should be most impressive, it is cheaply theatrical. It will never br ranked among even the second-best compositions of Massenet, who for the last few years has been incredibly industrious in the attempt to prove that he is still the leader in French music.” (Journal (April 9, 1902): 5, GB) A CD was made in 2000 by the Oratorio Choir of the Cote d’Azur and a DVD was made in 2012 of a performance at the Massenet Festival. The Society page of the Herald reported: “Mr. Henschel and Miss Helen Henschel are receiving so much attention from their old friends that they are not able to accept half the invitations which are pouring in upon them.” They had just been in Bar Harbour and “today they are visiting Mr. and Mrs. B. J. Lang at their country home in New Boston, N. H.” Probably the fall presentation of Herschel’s Requiem was a topic of conversation, if not rehearsal, as Helen was to sing the soprano part. MRS GARDNER’S NEW MUSIC ROOM. “Mrs. Jack Gardiner’s Venetian Palace.” Published and postmarked 1904. Johnston Collection. “Word got around that the musicians had been treated like servants and ordered out a side door by an officious flunkey. Members of the famous Cecilia Society were supposed to be particularly insulted because they got no glimpse of the palace and no chance to partake of doughnuts and champagne.” (Tharp, 247) Just three month’s later women’s voices from the choir were to sing at Mrs. Gardner’s Birthday Party on April 13, 1903, but before this could happen, Mrs. Gardner “personally assured the 16 young women…that the New Year’s incident was one she deeply regretted,” and these words convinced the choir members to abandon their “strike’ and perform which they did “with the usual musical appreciation.” (Tharp, 341) The music was all by her friend and Boston Symphony member, Charles M. Loeffler. B. J. was the accompanist for six solo songs, and the choir took part in L’Archet (Carter, 205) of which they had sung the world premier just two months before. The Herald felt that among all of Wagner’s operas, Parsifal needed the visual element in order to be successful. “Wagner makes the greatest demand for the effects which must be had through the eye.” The reviewer also felt that this opera needed the stage settings which were missing in this concert presentation. Of the performance itself: “As it was, it was nearly perfect, being competent, right minded, beautiful, noble and imprerssive. It was vastly superior to its predecessor of 10 years ago…Mr. 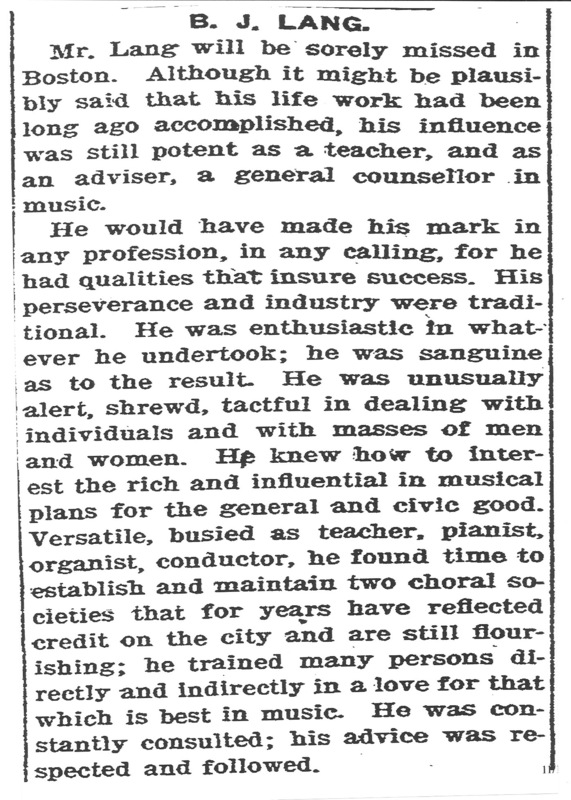 Lang conducted with firm, steady authority and a sustained calmness which he does not always command…There was a deservedly great ovation for Mr. Lang at the evening’s end.” (Herald (January 7, 1903): 9, GB) The review was unsigned-it may, or may not have been by Philip Hale who began on the Herald that year. Mr. and Mrs. J. Montgomery Sears held a lavish reception after the performance for which “Society Turn[ed] Out in Force.” (6698) This took the place of their regular Tuesday musicales. The Globe reported: “There is now being circulated in Boston, and signed by hundreds of musical people, a petition, headed by Mr. B. J. Lang, addressed to Herr Conrad, the new head of the Metropolitan Opera company in New York, asking that the grand opera Azara, written by Prof. John Knowles Paine of Harvard, be produced.” (Globe (April 27, 1903): 4) This was in connection with a concert staging of parts of the work that were to be given on Thursday evening, May 7 in Chickering Hall conducted by Ephraim Cutter Jr. “This concert will consist wholly of scenes from Azara.” (Ibid) Lang himself conducted a concert version of the work with the Cecilia in 1909 as Herr Conrad had not responded to the petition. “On Thursday evening society, with a large ‘S,’ will wend its way to the Berkeley Temple for the annual benefit concert arranged by Mr. Lang.” (Herald (March 20, 1904): 33, GB) This congregation had begun in 1827 as the Pine St. Church (Congregational) in central Boston, and then in 1860 a new building was built in the South End at the corner of Berkeley Street and Warren Avenue. It was designed to seat 1,800, and “Good music was from the first a feature of attraction. A double quartet and chorus were provided.” (Pratt, S. B., 38) By 1896 the church had 1,100 members, and was the largest Congregational church in New England. (Op. cit., 44) By this time the direction of the church was to aid those in need, and possibly this yearly concert was one means of raising funds. Lang played Bach, a violinist played the Andante from Mendelssohn’s Violin Concerto and a harpist joined Lang and the violinist in an Andante in G by the French composer Perilhou, which never had been performed in America. [It had only just been published in Paris by Heugel in 1899-BnF catalog; again, Lang was right on top of the latest publications.] The final artist was Miss Millicent Brennan, “whom Mr. Lang is bringing out on this occasion,” who sang songs by Dvorak and Beethoven. The Herald listed “some of the patronesses,” and this very long list began with Mrs. J. Montgomery Sears and included Mrs. Louis Agassiz, Mrs. Julia Ward Howe, Mrs. Curtis Guild, Mrs. Tryphosa Bates-Batcheller, Miss Alice Farnsworth and very many others. (Herald (March 20, 1904): 33, GB) This important list appeared in both the February 28th. (“the subscription list is steadily increasing,” 31) and the March 20th. editions. Many fellow musicians were openly jealous of Lang’s position as “teacher to Boston’s Society.” However, there must have been a number of times when these lessons were a chore. One such was giving vocal lessons to the socialite Tryphosa Bates-Batcheller who was one of the sponsors of the concert above. Lang is listed together with Henschel, Marchesi, Sgambati and Giraudet as some of her famous vocal instructors. At the age of 18 she went to Paris where Madame Marchesi advised that if she would give up all other studies, she would become among the most remarkable voices of the century. She didn’t do this, instead returning to Boston and beginning studies at Radcliffe. Two a further years in Paris, then marriage, the rest of her life was that of being a “relentless social climber who chased after aristocrats and royalty.” (Wikipedia, accessed March 27, 2019) A month before Lang’s concert noted above, Mrs. Bates-Batcheller gave a song recital “at the solicitation of numbers of them [friends].” (Herald (February 7, 1904): 31, GB) Among the patronesses of this concert were Mrs. Julia Ward Howe, Mrs. John L. Gardner, Mrs, Eben D. Jordan, Mrs. William Gericke, Mrs. Philip Hale, Mrs. Charles Inches, and…Mrs. B. J. Lang. Only patronesses were listed; no patrons, no Mr. Lang. The current Wikipedia article compares her to Florence Foster Jenkins, calling her even a “greater” bad singer. An example of her voice can be heard on YouTube. A National convention of music teachers provided Lang the opportunity to present one of his favorite compositions. As the performance dates were July 7 and 9, 1903 at Symphony Hall. Lang was the Chairman of the “Music Committee” for the event which included among its 12 other members – Allen A. Brown, G. W. Chadwick, Carl Faelten, Arthur Foote, Wilhelm Gericke, Henry L. Higginson and John K. Paine. Certainly a very impressive group! (6713) As many of his own singers were on vacation, Lang invited other choirs to participate. He wanted 150 men. In addition to the Cecilia men, the Handel and Haydn Society provided 50; his own Apollo Club, 25; “and others came from the Boston Singing Society and the Amphion club…The Cecilia was equal to the demands for female voices, so that no outsiders were necessary in the sopranos and altos.” (Globe (July 5, 1903): 32) Four choral rehearsals were required-all held within two weeks. Among the soloists were the soprano Louise Homer-Marguerite, who had been locally trained, and the bass Leverett B. Merrill-Brander, who was then Lang’s bass soloist at King’s Chapel. The other soloists were: Mr. Joseph Sheehan-Faust, Mr. Gwilym Miles-Mephistopheles and Mrs. Bertha Cushing Child-Heavenly Voice. Lang’s continued prominent place within the Boston musical community is reflected in his role as a featured performer in the Tuesday evening, April 14, 1903 Concert commemorating the founding of the House of Chickering & Sons eighty years before in 1823. “On opposite sides of the stage…were placed the first piano made by Jonas Chickering and a modern Concert Grand.” (Commemoration, 14).The concert consisted of five songs sung by Miss Mary Ogilvie accompanied by Mrs. S. B. Field which included Margaret’s My True Love Lies Asleep followed by an address by Dr. Edward Everett Hale (who was also celebrating his 80th. year) with a conclusion of two pieces played by B. J. First he played The Battle of Prague by Kotzwara that was “a piece of music greatly in favor about 1823,” and then a portion of La benediction de Dieu dans la Solitude by Liszt, “a composition in vogue at the present time.” (Commemoration, 14 and 15) The program book included engravings of the first Chickering factory at Washington Street that was destroyed by fire in December 1852 and then the factory that replaced it in 1853 which covered a full city block. CHICKERING ORCHESTRAL CONCERTS. ADS SAID-CHICKERING PRODUCTION CONCERTS. The second Season (1905-06) was very different; there were at least twelve concerts, but they were all of chamber groups, and the Artistic Director was H. G. Tucker (one of Lang’s piano pupils). 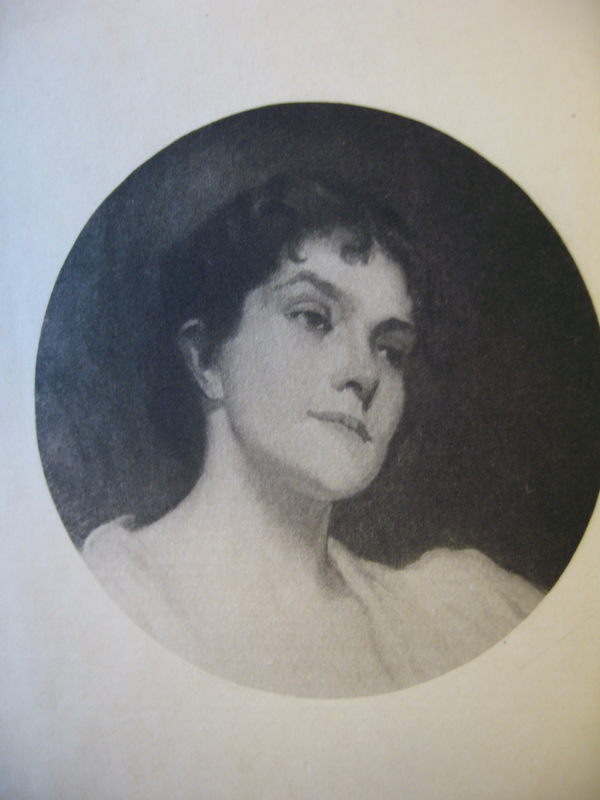 During the Third Season (1906-07) two songs by Margaret were performed – The Sea Sobs Low [never published ?] and Spring sung by Bertha Cushing Child, contralto accompanied by Arthur Colburn. During the next season Summer Noon was sung on January 6, 1907 by Miss Mary Desmond, “the English Contralto” with Mr. A. de Voto as accompanist. At the January 10, 1909 concert Arnold Dolmetsch used a harpsichord and Clavichord built by Chickering. B. J. (teacher-aged 65) and Rosamond (teacher-aged 24) returned from Europe (Liverpool) on the REPUBLIC arriving September 2, 1904. (Boston Passenger and Crew Lists, 1820-1943) Also listed just above B. J. was John H. Gutterson, age 39, teacher, and after Margaret was Mr. F. H. B. Byrne and Miss Alice S. Larkin. Bryne had traveled with B. J. during the summer of 1897. 1905 $21,200 $115,000 Figures from the Herald of each year. In 1905 came the announcement that the Ruth Burrage Room was now located in the Steinert Hall building with the pianos and the use of the room being a gift from Messrs. M. Steinert & Sons. With its library of “four-hand and eight-hand music for two pianos intended for the use of persons who play such music tolerably well at first sight…Information about the rules for the use of the room may be obtained from Mr. B. J. Lang, 6 Newbury Street.” Since the library had first opened, there were frequent additions which came from the Miss Ruth Burrage bequest. (Herald (September 24, 1905) 37, GB) An earlier article in April 1905 has mentioned that the scores would be available “as a free circulating library at Mr. Lang’s new studio, 6 Newbury Street.” (Herald (April 23, 1905): 38, GB) Certainly having Steinert host the library and provide the pianos was a much better solution. On Monday evening April 2, 1906 The Cecilia Society presented La Vie du Poete (The Life of the Poet) by the French composer Gustave Charpentier which was scored for chorus solo, voices, three orchestras and organ-Mr. B. L. Whelpley was the organist. Also on the program was Taillefer, a Ballade by Richard Strauss which used chorus, solo voices and orchestra. The Charpentier had been premiered in Paris during the 1892-93 season where it had five performances. The Strauss had first been performed at Heidelberg in 1903 with the first American performance being given by the New York Oratorio Society in 1905. This was its Boston premier according to the Globe. (Globe (February, 7, 1906): 4). The Charpentier was also probably a Boston premier, but the program book does not say this. (Johnson, First lists neither)(Program, Johnston Collection). RESIGNS FROM CECILIA. RAISED $1,000,000+ FOR THE ENDOWMENT. Thirty-one years ago, the Cecilia Society began its concerts under your direction. The Society desires to express to you in some way its appreciation of what you have been, and what you are to it and to the cause of music in Boston. The directors therefore ask you to allow them to give a concert in your honor, at such time and in such circumstances as may be agreeable to you. I thank the Cecilia most heartily for its kind proposal of a concert in my honor. If the Society will sing at a performance of the Children’s Crusade, it will give Pierne’s beautiful work in a peculiarly fitting way, and give great pleasure to… Yours sincerely, B. J. Lang. An article in the Globe wrote of the upcoming concert: “Rarely has a combination of pleasant events, creditable enthusiasms and worthy objects come together for hard work more happily than in the plan for a concert next Wednesday night in Symphony Hall in honor of B. J. Lang, on his retirement from the conductorship of the Cecilia Society…No musician in Boston is better known or more loved than he.” (Globe (April 14, 1907): ?) 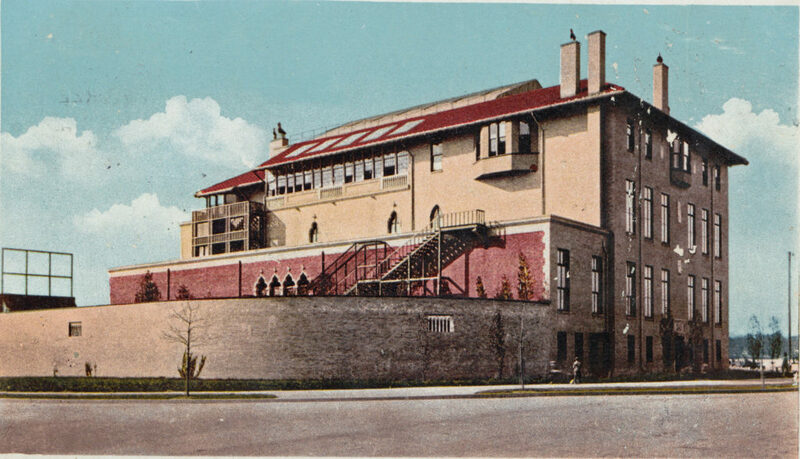 The concert was given on Wednesday night, April 17, 1907 to benefit the Industrial School for Crippled and Deformed Children by the Cecilia Society, nine soloists, a chorus of 100 children, and sixty players from the Boston Symphony. Tickets were $2, $1.50, and $1, and could be ordered from the fifteen members of the Auxiliary Board of Managers that included Mrs. John L. Gardner of Fenway Court. The “audience and chorus arose to welcome Mr. Lang as he came to the conductor’s stand. He was forced to bow repeatedly, and it was only after prolonged applause that the performance could begin. After the second movement of the work, the moment’s intermission was much protracted by the presentation of flowers and wreaths, and the enthusiasm was repeated at the close of the performance.” (Herald (April 18. 1907): 9, GB) The Herald’s Social Life page described Lang “standing before a sympathetic, distinguished and deeply interested audience…There was no speechmaking, only graceful bending of the head in acknowledgement. Everyone seemed to feel the deep significance of the occasion, and Mr. Lang must certainly have been gratified by such a tribute, evidently so heartfelt. ” (Herald (April 21, 1907): 27, GB) Then followed a long list (66 lines!) of socially important people and what the women wore, with it noteing that “Mrs. B. J. Lang, in black voile with white lace, and Miss Rosamond Lang, in gray with lace of the same tone” were in the audience. (Ibid) Margaret was not mentioned-was she singing in the choir? MASTER OF ARTS DEGREE FROM HARVARD. Thompson, Life of Ethelbert Nevin, 27. B. J. died at his home on April 4, 1909 at 8 Brimmer Street (his home for the last twenty-five years-he also had a summer home on 600 acres in New Boston, New Hampshire, “passing away just as the bell in a nearby church was striking the hour of 9″ after suffering from a heavy cold for three weeks that turned into four days of pneumonia; his three children were at his bedside, but his wife was confined to her bed due to a fractured leg that had happened three weeks before while returning from church. He was 71 years old.” [71 Years, 3 Months, 7 Days-Death Certificate] The Death Certificate listed the Primary Causes of Death as: Lobar Pneumonia for 4 days and Pericarditis (Sack around the heart) for 2 days. A Contributory Cause was Osteitis Deformans (Paget’s Disease-enlarged bones-a form of arthritis) which he had been suffering with for an unspecified number of years. On Wednesday night he had attended the opera. Though he wasn’t feeling well, he wished to accompany his daughter to the performance and the next morning he was unable to rise from his bed.” (Herald, Obituary, April 5, 1909) “It is told the Listener that on Palm Sunday evening, while B. J. Lang was dying, the quartet at the Old South were singing the Hymn of Praise, which he (probably for the first time) did at the original Old South thirty or forty years ago.” (Gould clippings) Less than a week later, at the BSO concerts of Apr. 8 and 10, Mozart’s Masonic Funeral Music was played in his memory. The Mozart opened the program, and was followed by world premier of Chadwick’s Theme, Variations, and Fugue for organ and orchestra. Also on the program was another Boston premier, “Spring” from Musical Picture for Orchestra Opus 34 by Glazounoff. How appropriate that the concert should include two premiers-this was probably more a tribute to the work of bringing new music to Boston done by B. J. than was the playing of the Mozart. Rev. Howard N. Brown, minister of the church where Mr. Lang had so long been in charge of music, met the body at the porch. Over the black broadcloth casket was thrown a purple pall, on which rested several fronds of sago palm, this final preparation having been made by Mrs. John L. Gardner, who, with a few assistants, had previously arranged the mass of floral tributes around the casket.” (Funeral notice-Transcript, Apr. 9, 1909) The Journal added: Mrs. Gardner placed a large floral harp of roses and ferns sent by the Boston Symphony in a central position and then arranged other “choice pieces” from the Handel and Haydn Society, the Cecilia Society, the Apollo Club, and the Baermann Club around it. She also placed a purple pall over the coffin while it was in the vestibule “before the body was borne into the sanctuary.” (Journal (April 8, 1909):. 7, GB) The three children sat in the front row, but Frances could not attend because of her recent fall. Except for accompanying the hymns, the organ was silent, “as though its very silence were a mute tribute to him whose fingers were so familiar with every detail of its keyboard.” (Transcript, Op. cit.) The hymns were the choruses O’er The Strife and Ten Thousand Times Ten Thousand accompanied by Wallace Goodrich. B. J.’s career and standing in the musical community was probably best summed up by the remarks of Margaret who at the age of 95 wrote to Barbara Owen that “He was an example in all ways: honor, uprightness, and principle… he has left with me a standard of cultivated beauty.”(Owen, 59) But, Foote had already written over 65 years earlier that “Lang was a musician of great gifts and very versatile; a composer of originality, who would have been considered one of our leading men had he published.” (Foote, Auto., 45) In a 1911 article Margaret “said that the last work with which he [B. J.] was interesting himself [just before his death] was the translation from the Italian of a book on Gregorian music.” (Christian Science Monitor, March 25, 1911) She also noted that the last work he conducted with the Cecilia Society was by a contemporary French composer. An obituary article in the Springfield Massachusetts newspaper had a couple of negative comments: “His gift was not for the piano, where his touch was faulty and lacking in delicacy. He was much more at home at the organ, and his church work was quite as important as his directing of choruses. As a drillmaster of singers he had much success, and was a great favorite with his choruses; with the orchestral instruments he was never on such easy terms. As a teacher he was popular and successful, and he was a social favorite. In all these ways he exerted a great influence on the musical life of Boston, surviving from the old simple days which John Sullivan Dwight has depicted in his critiques into the most complicated and sophisticated musical Boston of the 20th. 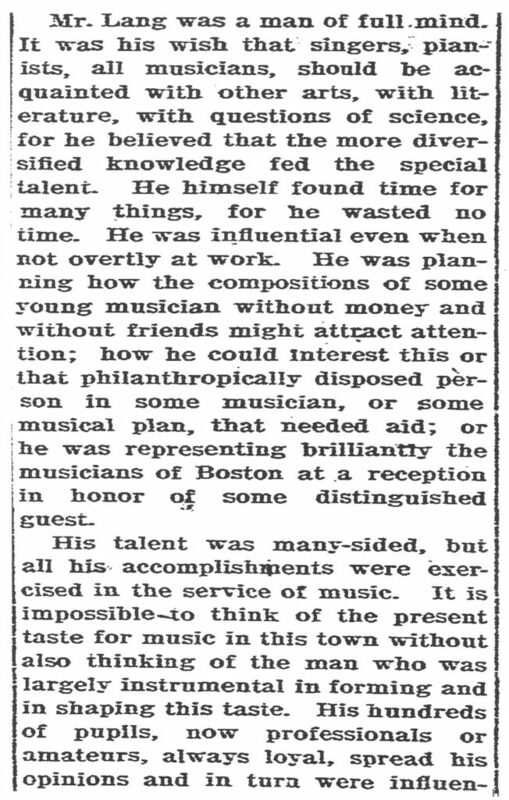 century.” (Springfield Republican (April 5, 1909): 5, GB) Certainly this last comment was a very important one, for throughout his career Lang kept up with the changes in the musical world universal. His interest in French music in his later years was reflected in his conducting of Debussy for the Chickering Concerts. The next night, Friday, December 3, 1909, the Harvard Musical Association remembered Lang with a “In Memoriam” Concert played by the Hoffmann Quartet: Jacques Hoffmann, First Violin; Adolf Bak, Second Violin; Karl Rissland, Viola; Carl Barth, Violincello. The concert opened with “Andante funebre e doloroso ma con moto” from Quartet Op. 30 by Tchaikovsky, and continued with Quartet in E Flat major by Dittersdorf, Quartet Op. 14 by Alexandre Winkler (first Boston performance), and finally the “First Movement-Allegro” from Beethoven’s Quartet Op. 59, No. 1. It was certainly appropriate that a first performance should be part of a program in honor of Lang. In B.J.’s will (1909-#145059) he gave Margaret “my autographs of eminent people, framed and unframed and my Parsifal cup” while to Malcolm he gave “music and books, my body of programs and notes, and the Handel and Haydn Society watch.” A watch chain had been given to B. J. at a reunion of the Handel and Haydn chorus members held on June 14, 1865. 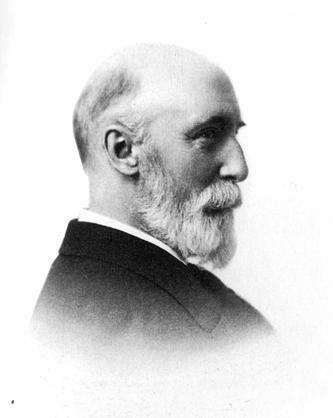 Speeches were made, Gilmore’s full band performed, various gifts were presented, and F. G. Underwood “then presented to Mr. B. J. Lang, organist of the Society, a handsome gold watch chain, prefacing it with an admirable speech, to which Mr. Lang responded…The reunion was the happiest social gathering that has ever been held under the auspices of the Society.” (BMT (July 1, 1865): 100 and 101) To Rosamond he gave “Music and books remaining, my silver box of Liszt’s hair, my Cecilia silver cup… and my music watch.” $5,000 each was given to Harvard and Yale to benefit their Music departments. He further gave $10,000 each to the Handel and Haydn Society and the Cecilia Society and $5,000 to the Apollo Club.